GeoConnected: LoopLink RLC or LoopLink PRO: Which Is Right For You? LoopLink RLC or LoopLink PRO: Which Is Right For You? Both have their place. With the recent addition of LoopLink PRO to our offering, we're now being asked about when it's appropriate to use one over the other. Given the fact that heat transfer in the ground is the same in a residential system as a commercial, which one do you need for a given application? Even though PRO can be used to design a system of any size and scope (residential or commercial), RLC will make life much easier for the residential designer. This article will help you decide which is better-suited to meet your needs. What is a “residential” system? Generally speaking, you can use “residential” ground loop design software on any building where its heating and cooling loads are closely tied to weather conditions. In such a system, there is minimal need for consideration of how the building is being occupied or used. There aren't large amounts of internal gains, occupancy rates, ventilation requirements, industrial processes, etc. Once the building load profile is generated, it is also a straightforward process to determine how much a heat pump will have to run, how efficient it will be, how much it will cost to operate, how much will required of the ground loop, etc. 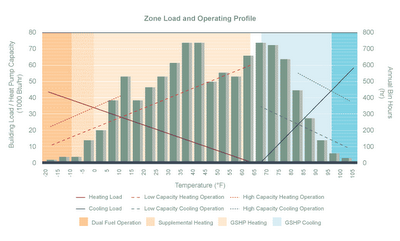 Because of the predictable behavior of a residential building, RLC can use a small amount of information (peak heating and cooling loads along with project location) and use it to perform a full-fledged energy analysis. It doesn't really matter how big the system is. As long as there is a linear relationship between the building loads and the outside air temperature, the bin method can be used to predict how much heating or cooling will be required. Offices - computers, monitors, copiers, appliances, etc. Manufacturing facilities - CNC machines, paint booth, welders, etc. Restaurant – range, oven, coolers, etc. Not only do you need to consider how much each process or component will contribute to the heating and cooling requirements for a building, but you also need to consider when each is used (e.g. – schedule). Attention to detail is critical for this time-consuming process. A good portion of the heavy lifting (e.g. - the energy model) is done outside of ground loop design software. But by decoupling the energy model from the ground loop design calculations, you can analyze a much more complicated system. Each of the programs listed above will export the data in various formats. The outputs are the result of a lot of hard work but are condensed into a usable format that can be directly imported to PRO. As previously mentioned, PRO could be used to design the ground loop for a residential system. However, it doesn’t perform energy modeling calculations so, you would need to obtain that information elsewhere. For a residential application, it would save a lot of time and effort to use LoopLink RLC for the design because it will perform the energy modeling calculations for you. Can the heating and cooling requirements for a building be accurately predicted with weather data alone, or do you also need to know something about building usage and its schedule? Once you’re able to answer, hopefully it will be easier to choose between LoopLink RLC and LoopLink PRO moving forward.